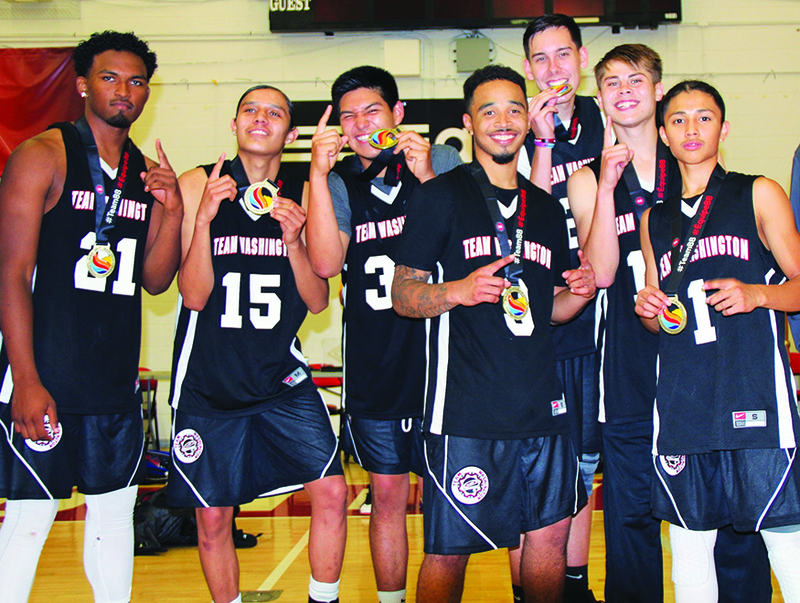 Team Washington’s 19U men’s basketball team (led by Tulalip tribal members Bryce Juneau, Robert Miles and Darion Joseph) participated in a highly competitive, week long tournament at the 2017 Native American Indigenous Games hosted in Toronto, Canada. Dubbed “the Native Olympics”, Team Washington represented their tribal communities proudly while coming up clutch game after game on their quest for Gold. After dropping their opening game in pool play, a 69-73 loss to Wisconsin, the team had little doubt they would bounce back. In fact, talking to the players immediately after they were eager to get back on the court and prove they were much better than the first game showed. Their coach echoed that sentiment. They were right. 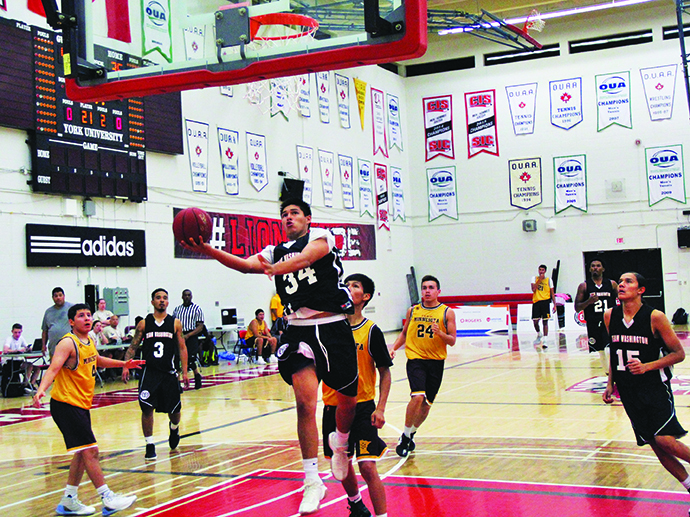 The momentum and confidence showed big time the very next game when Washington played Ontario, the host team, in a jam-packed gym of Ontario fans. The loud and cheerful fans fell silent as they watched Washington execute its offense easily over and over against Ontario’s defense. Leading by double-digits most of the game, Washington won 71-55. They were led by Darion Joseph’s game high 18 points. Only hours later Washington was back in action, this time with a matchup with Northwest Territories out of Canada. It was a complete and utter smackdown served up by Team Washington. With a blazing pace of play and all-go attitude, they boys were scorching hot on offense. They led a whopping 47-9 at halftime on route to a 90-28 victory. This time it was Bryce Juneau scoring a game high 19 points, followed by 17 points from Robert Miles. Coming off back-to-back wins that showcased the style of play Team Washington (2-1) expected to play, they would have their medal tested versus Team Manitoba (3-0). Playing another team from Canada meant another gym completely full of fans rooting against them, but Washington relished it. 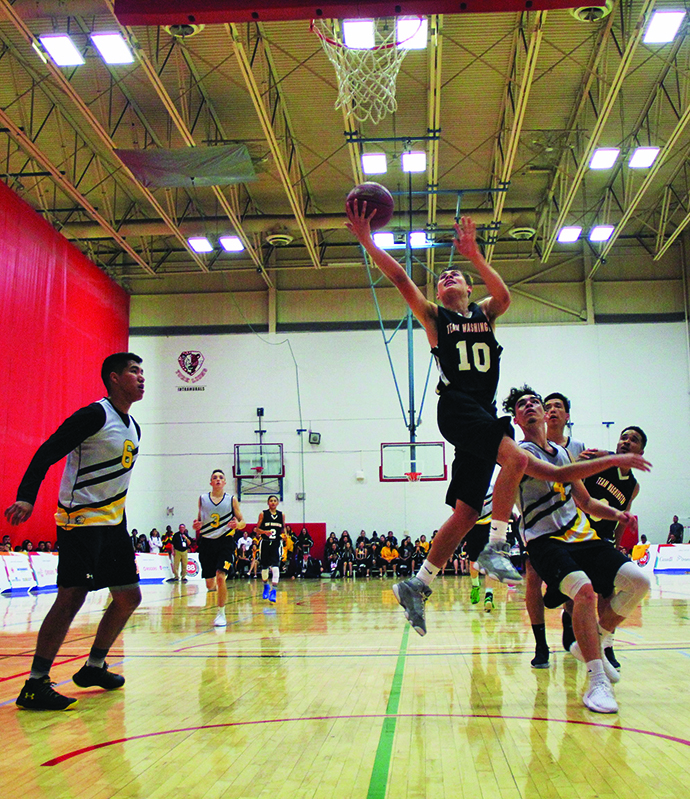 In order to win their pool, make it to the semi-final round, and keep hopes alive of playing for a gold medal, Washington had to beat undefeated Manitoba. The game was a true back and forth battle. Both teams were bringing it on both ends. At halftime Washington trailed 37-39. The teams continued to trade buckets and answer each other’s scoring run with an equalizing string of points. It was only fitting that at the end of regulation the score was 73-73, forcing overtime. Washington connected on back-to-back 3-pointers by Robert Miles and Tre Williams to open the overtime period. Manitoba again answered back to tie the game at 79-79. Darion and Bryce then took over with a series of pick and roll plays that gave their team the winning advantage, while silencing the gym of ruckus Manitoba fans. 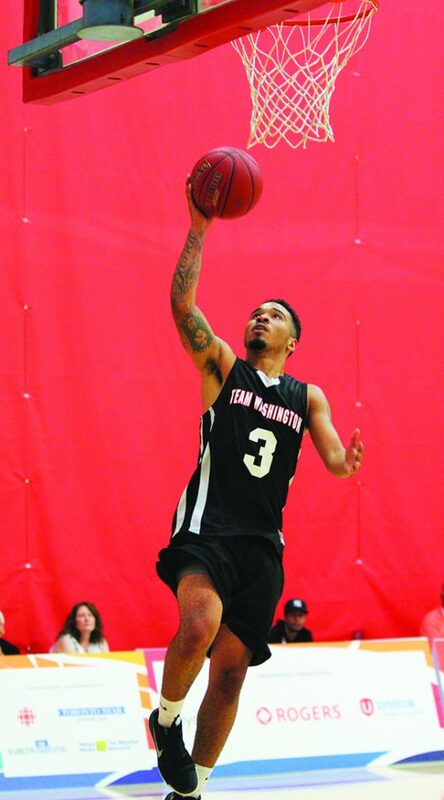 The 87-83 win put Washington on a three-game winning streak, but most importantly it meant they won their pool and would play in the semi-final round. On Friday, July 21 Team Washington (3-1) played an early morning, semi-final game versus fellow west coast team Vancouver B.C. (3-1). A berth to the gold medal game was on the line. In the first half, each team played to its strength. Washington looked to get the ball down low to its bigger, stronger forwards while B.C. looked to push the ball in transition at every opportunity and beat Washington down court. The Tulalip led team were down 36-38 at halftime and watched the deficit grow to 9 points when they trailed 48-57 near the end of the 3rd quarter. It was in the game’s crucial moments that Robert Miles was at his best. He was a monster on defense, getting his hands on every loose ball and deflected any pass that came his way. Then on offense he got red hot when his team needed it most. He hit a pair of 3-pointers and several free-throws that gave Washington a 67-65 lead with five-minutes to play. From there are Bryce and Darion again ran their two man game to perfection. 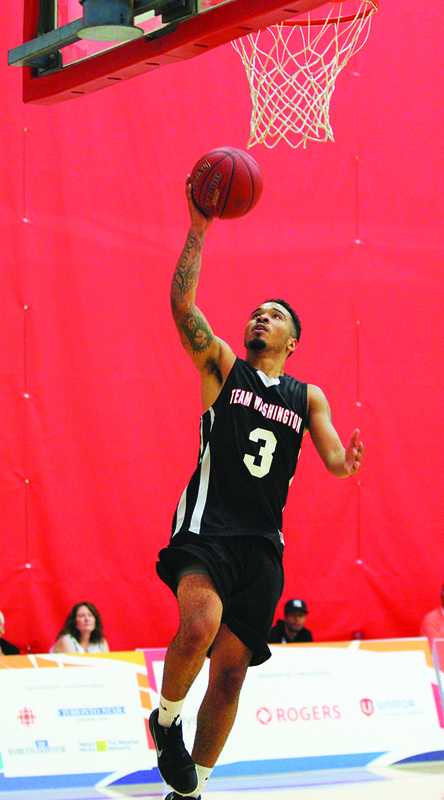 Darion scored on series of pick and rolls that sealed the W for Team Washington, 82-76. Incredibly, the three Tulalip boys combined to score 21 of the teams 23 points scored in the deciding 4th quarter. Washington now (4-1) got a few hours to rest and rehydrate for an impending matchup with Team Minnesota (5-0) in the Indigenous Games basketball finals. Minnesota led the entire competition with an astounding 105 points per game average, while Washington boasted a stifling defense that only allowed 63 points per game to their opponents. It would be a battle of contrasting styles with the gold medal on the line. 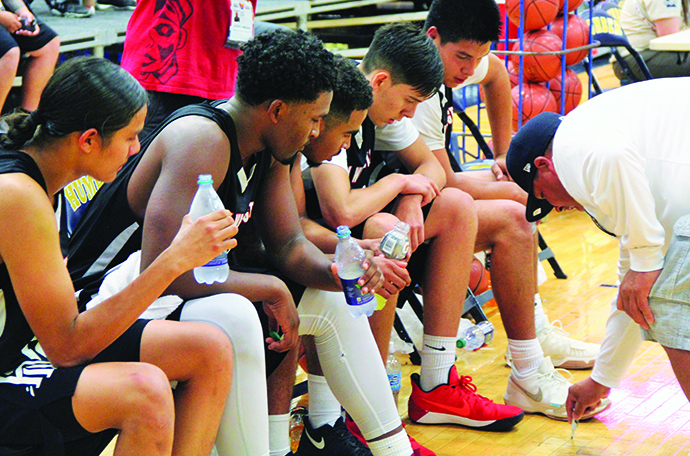 As basketball fans and players from various team across North America filled the stands to watch the gold medal game, Team Washington put on a defensive clinic. They had played zone defense for nearly the entire competition to this point, but against Minnesota’s shooting arsenal Washington switched to an aggressive man-to-man defense. The strategy paid off huge as the quicker and taller Washington defenders contested every single shot and cut off every passing lane. At halftime Washington led 48-36. There is a classic saying “the best offense is a good defense”. Team Washington proved that saying true. In the 3rd quarter, with center Mike Leslie in the game coming up with big time blocks and guards Bryce and Rob getting steals, Washington turned several Minnesota turnovers into easy scoring opportunities. Up 20 points, 75-55, the game was out of reach for a Minnesota team that couldn’t solve Washington’s lockdown defense. 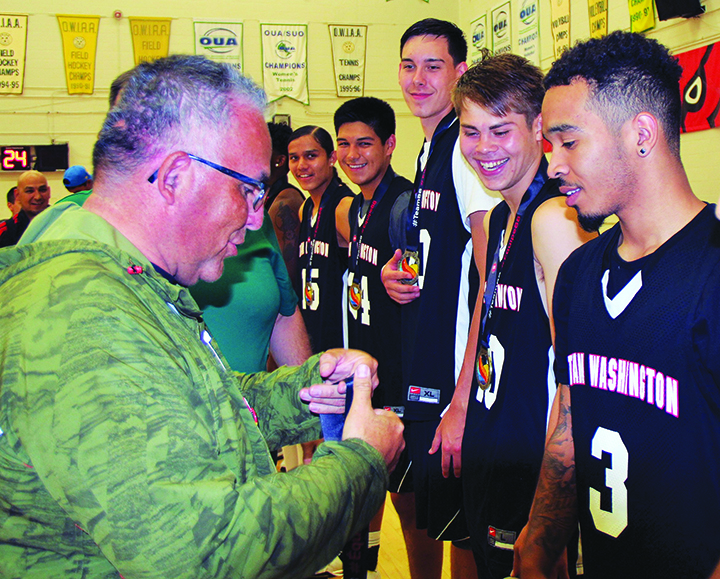 When the final game buzzer sounded Washington had won convincingly, 93-77, to claim the title as best Indigenous basketball team in North America. Following the medal ceremonies, where the boys and their coaches were beaming with pride and excitement as they were each presented with a gold medal, the Tulalip tribal member athletes reflected on their North American Indigenous Games experience. This entry was posted in News, Sports, Top Story, Tulalip News and tagged NAIG, Native American Indigenous Games, Team Washington, Tulalip, Tulalip Tribes by Kim Kalliber. Bookmark the permalink.